Seafood recipes can be healthy, hearty or light. Seafood itself is extremely versatile; you can enjoy luxurious smoked salmon with light cream cheese and a sprinkling of dill in the summer, then bake up a salmon fillet with new potatoes, green beans and a thick white sauce for those cold December evenings. Compared to many meats, seafood is incredibly tasty. It’s bursting with the flavours of the sea and often you’ll find basic seafood recipes can be unbelievably delicious with minimal seasoning. Don’t just go for your usual cod, prawns and tuna. Why not try mussels swimming in a rich white wine sauce, or make up a seafood risotto with squid, haddock, peas and chorizo? Before we took to the seas and brought back delicious fish to serve with buttery sauces, we foraged our coastlines. From mussels, cockles and seaweed to whelks, eels and crabs, we’ve been creating seafood recipes since we were hunter-gatherers. Many ancient seafood recipes have been lost, while others have carried on to modern times. Simple seafood recipes from robust, warming seafood pies with buttery pastry, to creamy summer soups with prawns, mint and peas. There is a plethora of vibrant, delicious dishes you can make with your freshly caught, native seafood and a generous slice of butter. You can enjoy a few oysters, gulped down as a starter meal, or snack on battered scampi as you stroll up and down sunny beaches. Fall in love with seafood again as you explore a secret, forgotten world of succulent sea-born treasures. From a simple butter dip for your scampi to an elegant white sauce for your scallops. Butter creates a creamy blanket for your tender seafood to rest in. Combine butter with lemon, garlic or herbs of your choosing (dill, parsley and tarragon are traditional choices for fish dishes) and leave it in the fridge to set. Serve in mannikins with your favourite baked or fried seafood recipes for dipping or spreading on fillets. Lurpak with Crushed Garlic goes particularly well with shellfish, like muscles, oysters and clams. Serve in a melted buttery sauce with a side of warm crusty bread. 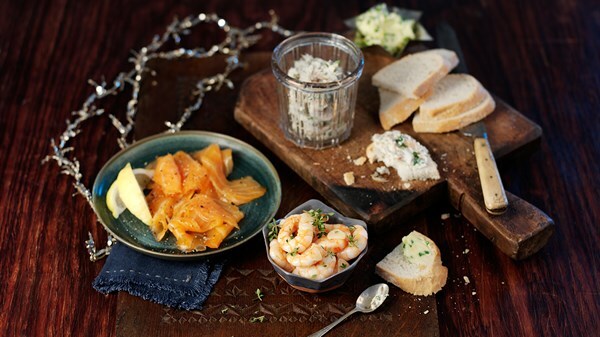 Whether you adore luxurious smoked salmon, juicy king prawns or savoury smoked mackerel, our festive seafood sharing platter has a little something for everyone. It’s the perfect festive treat and a great way to break from the turkey in the days between Christmas and New Year’s Day. There’s an unfortunate preconception that seafood makes for a light dish, rather than a filling meal. Once you try our salmon Wellington seafood recipe you’ll quickly change your mind! Rich salmon, fresh baby spinach leaves and soft shallots encompassed in a light puff pastry shell (homemade with Lurpak salted butter is best) makes for a hearty dinner. 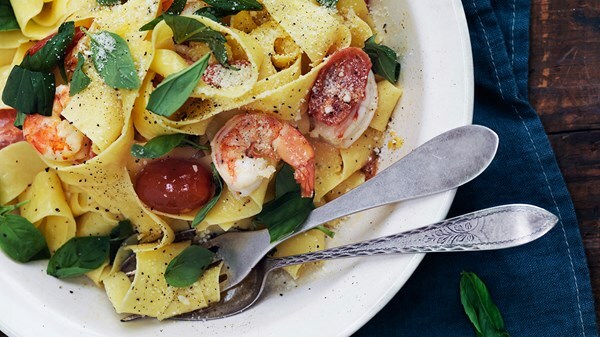 We love pasta and seafood – this pasta with prawns dish is a match made in prawn heaven. Fresh parpadelle pasta lightly tossed with garlic, basil, tiger prawns and cherry tomatoes is a great way to introduce hesitant friends and fussy eaters to the wonderful world of seafood recipes!